This year has been a whirlwind of life-changing events — buying and selling a house; moving our family (and newborn daughter) to a new state, neighborhood and town; changing jobs. My husband started a new job and I left my executive-level position and am still looking/working toward my next career opportunity here in ATL (or virtually). To top it off, July 19th my husband and I celebrated our 10-year wedding anniversary! I always imagined spending my 10-year wedding anniversary in some exotic country, exploring a new culture, eating new food with my hubby, and camera in tow ... but sometimes life does not line up the way you expect it to, and that’s okay. This anniversary, we decided to stay locally and explore our new (and awesome) city of Atlanta, GA. We haven’t had an opportunity to see much of the city yet so we figured we would start with Downtown. Atlanta has a lot to offer. 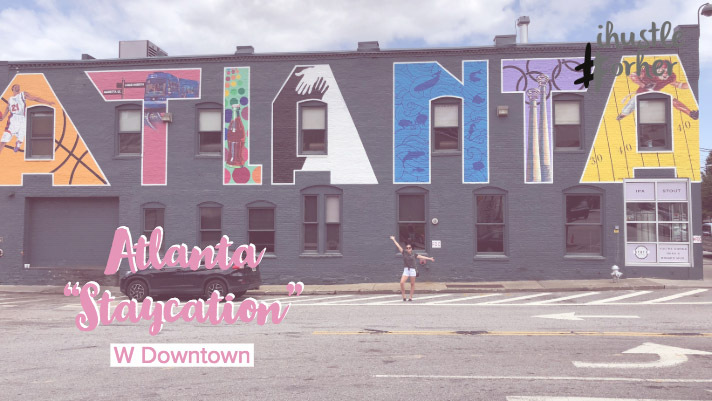 There is Midtown, Downtown, Buckhead and all the awesome places that sit right outside the perimeter, and we look forward to exploring it all, but Downtown seemed like the right place to start. My husband and I typically love W Hotels and stayed at the Buckhead W a few years back. We had a good experience, so we picked the W Downtown Atlanta as our staycation hotel. My hubby has platinum-status with Marriott and Starwood so we used points for a two-night stay in the city. When we arrived, we mentioned it was our anniversary and the front desk staff was very sweet, offering us an upgrade and $50 credit to be used anywhere at the hotel. This was very nice, but as a side note, since Jake is a platinum member, he would have likely been upgraded regardless. BUT, I don’t think we would have gotten the $50 credit, so that was super nice. We spent it all at the bar of course! I was SO excited for this stay. I needed a break and some time to be an adult and wife again. Having a baby clinging to you 24/7 is hard and it is important to give yourself a break every now and then. The week of our staycation, I was so anxious I would miss the girls, and especially the baby, since I've been home with them for the past nine months. But I knew it was important to have this time with my husband. As parents, it can be hard to take a step back and appreciate our spouses in the mix or hustle of everyday life. Anniversaries are the perfect excuse to have some adult time — and sleep in! We were so lucky my mom was willing to watch our girls while we enjoyed this Atlanta adventure. So getting back to the hotel. We went up to our room and it was nice at first sight; the setup was kind of like a mini suite. The room had a nice couch and chair with a king-size bed, and was a corner room with wall-to-wall windows. Unfortunately, our view sucked, but the window wall corner concept was cool. As we looked around it was obvious that this hotel room had been partied in quite a few times. There were chunks missing from the furniture and the carpet was stained. To be honest, it was nowhere near what I expected of the W standards and of a higher-end hotel. As the weekend progressed, we realized the W Downtown Atlanta was not our Jam. The pool was small and had a loud DJ on Saturday and only like 15 spots to sit. The hallways reeked of weed, I mean like EVERY time we walked to and from our room. The hotel was also kind of offset from everything downtown. Some people might prefer this, but I like the hustle and bustle of cities, so next time we will stay somewhere closer to Peachtree Street, or by Centennial Park if we stay down there with the kids. While on our staycation we ate and drank at some great places. On the first night, we had drinks at White Oak Kitchen & Cocktails. The vibe was rustic and hip and but more casual then expected. We only had drinks and I ordered something with gin from their craft cocktail list that was very good. We sipped down our drinks and headed to dinner at a Turkish Restaurant Called Truva. Our dinner was yummy — not anywhere near as good as Turkish Kitchen in NYC or Zaytinya in Washington DC, but good. The restaurant is on the second level and has a very cool Mediterranean vibe. I was pleasantly surprised when they had a Belly Dancer perform! It made the visit to Truva worth it and added a unique element to the night. This is a good date-night spot, but I want to point out it would also be a great place to bring the family. Without hesitation, I'd bring the girls to dine at this Atlanta restaurant. After dinner, we wanted to have a drink and check out the Red Phone Booth. The experience is set up to be like a secret speakeasy from the prohibition days. There is no sign outside and you must dial a code into a red phone booth to get in. The bar had a great craft cocktail menu and the drinks were good. It is a cigar bar too, so if that is not your deal (it's not mine!) the smell will bother you. If you are looking for a unique experience downtown check it out, but it was not the best date-night spot due to the smoke. On Saturday, we tried to have breakfast at the Atlanta Breakfast Club, but the wait was two hours! I want to eat there another time though, as the menu looks amazing! Instead we walked around and grabbed coffee and some food in the CNN Food Court and decided to have a bigger lunch at the Der Biergarten. The atmosphere was great, and we enjoyed chatting and sipping on a beer but the food was very blah. I guess that is to be expected of traditional German food. In summer it was too hot and heavy for my liking, but the ambiance was fun. Since it is by all the touristy stuff, it was way overpriced so if you do check it out, order drinks but skip the food. After walking around and exploring, we tried to go to the pool but that was too loud and there was nowhere to sit. So we went to the room and relaxed before heading out for a rooftop tour of Downtown Atlanta. First we went to the Westin Sun Dial Restaurant, Bar & View on Peachtree Street, and let me tell you the glass elevator ride up is NOT for the faint of heart, but the views were worth the trip. We ordered a drink and appetizer. The food was super basic and the drinks were good, but this is not a place where you come for the food. It is all about the views. If you are staying in downtown Atlanta and not afraid of heights, you need to at least visit the bar and take in the 360-degree views on the observation deck. After the Westin, we went for dinner at Nikolai's Roof. At first they sat us at a table with a freeway view so I asked to move (it was our anniversary celebration after all). They moved us but not to the table I asked for. They said it was reserved, however the people did not come until about five minutes before we finished our meal, so to be honest that was a tad annoying. The food was very good and they had a good drink selection as well. After dinner, we went back to the bar at the W Downtown Atlanta before heading up to bed. The bartenders were nice and it was not too loud or crowded for us to have a conversation, so that was nice. The next morning, we finally got a spot by the pool but it was 9 a.m. We ordered breakfast and it took forever to get there, but it was nice to have some hot coffee and relax in the morning for once. Overall our staycation in Downtown Atlanta was a great time. I can’t even think of the last time I ate so much good food and ordered so many adult beverages in one weekend! I recommend staying downtown, but would check out a different hotel — something we will do next time. If you like W hotels you will most likley be disappointed by the W Downtown Atlanta like we were. I have higher expectations for a luxury brand and the W Downtown Atlanta did not meet them. However, we would recommend the Buckhead W and look forward to trying out the Midtown W when we get the chance. Anniversary travel tip: Always let staff know you are celebrating!